The Air Force recently developed the Food Transformation Initiative (FTI) in order to enhance Air Force food service quality, variety and availability while maintaining constant learning and training program for Air Force cooks. The FTI is designed to enhance the menu, quality of food nutrition, and meet the servicemen’s expectations of what a good meal should be. 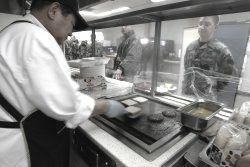 On Air Force Bases, to include Basic Military Training (BMT), the food is served hot every meal when not in the field. Plus, you have a variety of other options such as a sandwich bar, a salad bar with many fruits and vegetables, and a dessert bar. This is a typical cafeteria style eating establishment, but with food that is considered rather good. You will also have a variety of drinks to choose from. Typical coffee, sodas, water, milk, chocolate milk, juices, and Gatorade type sports drinks. The most important meal of the day is also one of the best in the Air Force. For breakfast, there will be eggs to order, scrambled eggs, hash browns, sausage/bacon, pancakes/french toast, juice, milk, cereals, coffee, and fruits. For the other two meals of the day, there are two lines: full hot bar meals, and a snack bar. A full meal will have the choice of two entrees (example, meatloaf or chicken). But you will also have daily options like hamburgers, grilled cheese, chicken ala king, veal, pizza – you name it. There will be several different kinds of vegetables each day as well. The snack bar line has hamburgers, hot dogs, fried chicken, sandwiches, chili, french fries, etc. There is also a salad bar, and desserts, including cakes and ice cream (if you T.I. says you can have sweets). The cafeteria-style serving line will begin with the hot food bar. If you do not like anything or need more food, you can also grab a few pieces of bread and make peanut butter and jelly (or banana) sandwiches at every meal too. However, once out of BMT, the food is considered so good, that many military members who eat at Air Force dining halls have to double down on their physical fitness in order to stay in fighting shape. It is easy to gain weight as you age, graduate challenging highly physical training programs, can access the dessert bar, and have more relaxed eating conditions. During BMT, the recruits cannot drink soda or access the dessert bar. Many people tend to lose weight when at Basic Military Training as you will be on your feet all day moving and burning calories at a higher than normal rate. The added PBJ sandwich can add extra calories to your meal and help you maintain body weight as well as provide energy for the long day of basic training. At Basic Military Training, it is recommended to eat as much as you can and add calories where possible. Rice and extra bread is a good addition to nearly all meals and is available near daily for lunch and dinner. However, the biggest concerns for recruits is getting dehydrated especially in the hot summer months of training. You will be required to drink three glasses of fluid at every meal (Gatorade, water, juice) before you rise from the table. Even though the meals at Air Force Basic Military Training are really good, the mealtime environment is fairly stressful as it is a time when the Military Training Instructors (MTIs), who are Staff Sergeants and above, start communicating with you. Typically, if your uniform is squared away, the MTI's will keep searching for the next victim. However, sometimes, it is just your unlucky day and the good food you selected in the cafeteria line will be eaten is a less than the peaceful atmosphere. Expect to be asked military knowledge questions if you get stopped by MTI's in the chow hall. If you know your stuff, you will pass and survive another meal at BMT. For the first couple of weeks, your meal-time will be limited. You'll only have a few minutes from the time the last person in your flight gets to the table to finish your meal. You'll learn not to waste time, and eat fast. However, after the first couple of weeks, you'll have more time for meals. During The BEAST training exercise, you'll also get a chance to sample MREs (Meals, Ready to Eat). These are, however, not the preferred choice for any military member if given the option to eat in an Air Force Dining Facility.